Nowruz celebration, between 1972 and 1975, Damavand College, Tehran, Iran. From accession no. 17-0824, Frances Mecca Gray papers. "The Future Begins Now," Damavand College promotional brochure, 1974. From Mary C. Thompson papers, accession no. 94-0815c. Damavand had its roots in the earliest Presbyterian educational mission in Iran, the Iran Bethel School for Girls, organized in 1872 as the sister institution to the Alborz School for Boys. 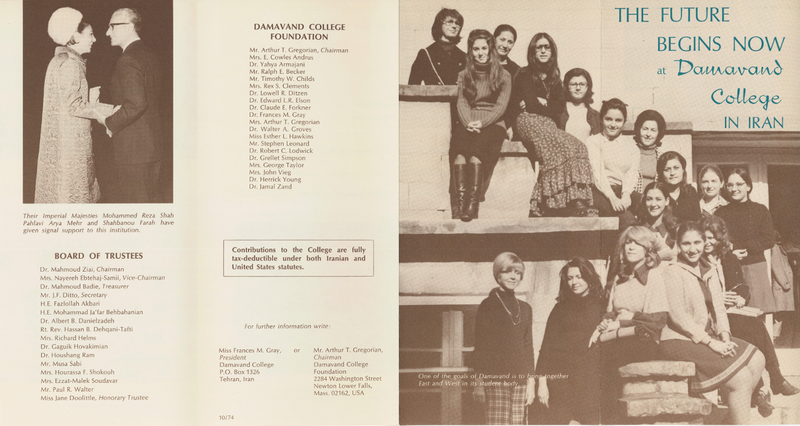 Reorganized as a college and renamed in 1968, Damavand offered coursework in English language and literature, Persian literature, arts and humanities; its curriculum was chiefly designed to equip a new generation of Iranian women to teach English. The school was uniquely close to the Pahlavi dynasty -- the Shah, described as Aryamehr in Damavand's pamphlets, gifted a 20-acre site to the school in 1969, allowing it to move out of Diba Alley in downtown Tehran. Images of Mohammed Reza Pahlavi and Empress Farah feature prominently in Damavand's promotional flyers and course catalogs -- and its international board of trustees included the Shah's personal financial adviser Mohammed Jafar Behbahanian and the notable Presbyterian chaplain of the United States Senate, Edward L. R. Elson. The college fit itself to the Shah's preferred narrative of rapid economic development and rapprochement between East and West. A fundraising brochure from 1969 exults: "Here in the heartland of Asia is a center where East and West do meet and where the rich and varied heritage of each may be shared in depth. Here is a center of liberal learning which renews the traditional ministry of cultural mediation for which ancient Persia was justly renowned and to which its present far-sighted leaders aspire." Six-year old Princess Farahnaz, breaking ground for Damavand, 1969. From Mary C. Thompson papers, accession no. 94-0815c. Damavand commissioned Frank Lloyd Wright's office for plans for the new campus, ground was broken by the Princess Farahnaz, and the spaceship-like Brutalist campus was still under construction in 1975, when Frances Mecca Gray retired. After the creation of the Islamic Republic in 1979, the school was effectively nationalized. By one account it was one of the last Western institutions to be fully incorporated into the Iranian Cultural Revolution's educational system. Much of its library, pictured here, was transferred to Allameh Tabataba'i University before 1983. 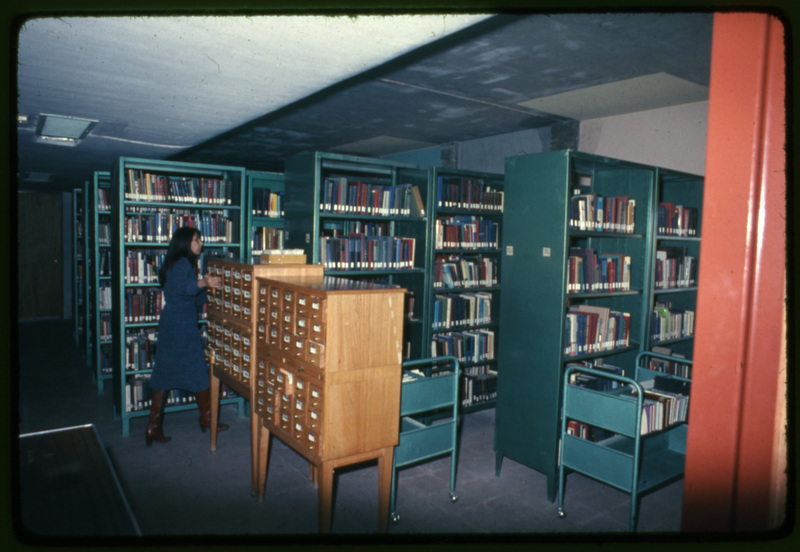 Damavand College library, between 1972 and 1975. Many more images and texts documenting the Presbyterian encounter in Iran remain in the hands of individuals and families, and we're always gratified to bring them before a wider audience. Stay tuned to this space for news of new accessions, and browse more of our Iran content in Pearl.